"3 year`s birthday party" at Chookyblue `s in Australia! Read all about it on her blog! 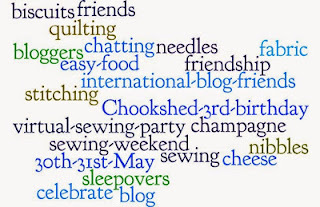 A cyber sewing weekend for blog friends. AND my GD has a performance, a play called " Circus". ballet. I`ll be watching from the front seat on Saturday! Moro at du også ble med på dette. Kos deg med både danseforestilling og søm! Glad to see you made it to the party!